Review: This follows Katniss Everdeen and friends as they attempt to overthrow the ruling Government including President Snow. She holds dear everything that hangs in the balance. Just like splitting the last Hobbit and also The Twilight saga books into two films they have done exactly the same with The Hunger Games. Did we really need them to be split up like this? 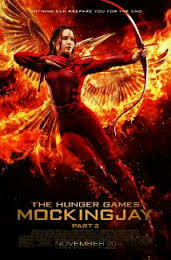 I have really enjoyed all of The Hunger Games films but I did find this one to be the weakest of the whole franchise (This is not to say I didn’t enjoy it). I will really miss The Hunger Games and at the end I did feel rather upset that there won’t be any more. Each of the films have never failed and have always stayed true to the story. It was very sad to see the late Philip Seymour Hoffman who has played an incredible part in this film. He will be greatly missed by so many. They couldn’t have done this film without Jennifer Lawrence who was been amazing throughout. Overall a brilliant conclusion to the franchise. This has got so many good performances from young to experienced actors which provides a very good balance which holds the film together.